Scion and licensing partner Sonae Indústria are one of twelve finalists in this year’s KiwiNet Research Commercialisation Awards. Together they have commercialised an innovative wood fibre reinforced plastic branded as Woodforce. 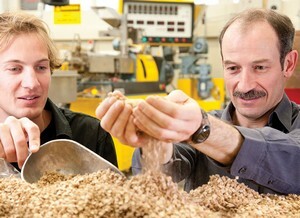 “Plastics made with wood fibre are stronger and stiffer than plastics alone but until recently, have not been commercially feasible,” says Business Development Manager Jeremy Warnes. “Scion’s patented process forms wood fibre into “dice” that can be made in existing MDF plants and easily added to a range of plastics. End products using Woodforce are more light weight, thermally stable and sustainable than existing plastic materials and are being trialled and approved by major automotive manufacturers. KiwiNet award winners will be announced on 30 June.